The godly leader is indeed a powerful witness for Christ. When we follow Christ’s example—and let Him take the reins of our leadership—we will experience a calling that is fulfilling beyond measure, and one in which the results are undeniable. I have found that the Lord rarely sends us blessings unaccompanied, and these past weeks have been filled with their share of trials and difficulties as well. Conflicting philosophies and styles of training have waged war between cadre members. Difficult decisions are in no short supply. I have found myself on my knees before God asking questions which I have never faced before. How do I lead in a manner worthy of Christ? How can I be a godly witness to these young men and women who must learn to obey and respect me? From these Scriptures I found out how I could properly be a follower of Christ who happens to be a leader—not a leader who happens to follow Christ. So often I have found that our spiritual pursuits and concerns become secondary to us. We attempt to “make room” for Christ in the chaos of busy lives. We in the military can find ourselves trying to fit Christ into our mold of military lifestyle rather than basing our very acts of leadership on His example. It is Christ who must come first and in whom our identity is found. In this way we are followers of Christ in the military, who God has called to be leaders. But finally, and most importantly, Scripture showed me an aspect of leadership that I fear many of us do not consider. In Romans 12, Paul discusses various spiritual gifts and callings, and tells us how to use these gifts to glorify God, “Having gifts that differ according to the grace given us, let us use them…the one who leads, with zeal” (Romans 12: 6, 8 ESV). God’s answer to my question, written through the hand of Paul long before I could ask it, is simple: a godly leader is one who is zealous about his leadership. For me, zealotry almost always conjures up images of freedom fighters throughout history: the Jewish zealots who opposed Rome, the Scottish rebels who opposed Edward I under William Wallace, or our own revolutionaries who fought for the independence of America. 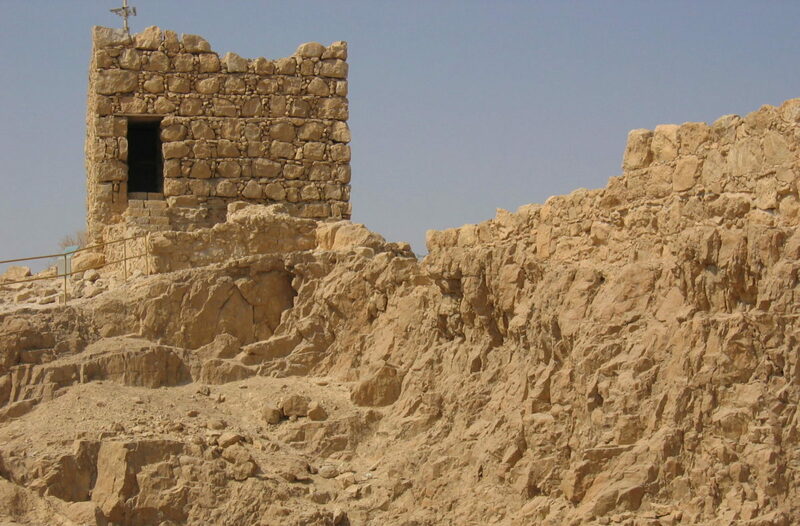 Some of the ruins of the fortress at Masada. During a trip to Israel, I was gifted with the chance to hike Masada–a mountaintop fortress built by Herod overlooking the Dead Sea. It was the location of the zealots’ last stand against the Roman empire, where a few hundred Jewish fighters held off tens of thousands of Rome’s best troops for a day before committing mass suicide to avoid enslavement under the Romans. From that vantage point I could see the remains of the Roman encampments. I could walk around the rooms where the zealots slept, ate, and worshiped God before going out to fight. From where I was standing that day, I couldn’t help but imagine those who had died. What were they feeling? What drove them? What kept them going? The answer is ardent devotion. These defenders—and countless others like them—never gave up searching for how to better their cause and give their all for what they believed in. A passionate leader is one who never ceases to fight for the men and women he leads. He never stops asking himself what he can do better–how he can improve both himself and those he leads. Many leaders miss this concept under the impression that they already know what they need to do. I believe that the Lord means for us to constantly pursue how to lead better—a battle where the objective is leadership itself. And if there is anything else the Lord has shown me, the battle to become a godly leader is one in which the victor is one of the most blessed in warfare. From my admittedly short and limited experience, I have found that leadership is one of the most fulfilling exercises of faith—one where the Lord entrusts us with significant power and influence over others. Very rarely will our lives be so scrutinized and our actions be so apparent. The godly leader is indeed a powerful witness for Christ. When we follow Christ’s example—and let Him take the reins of our leadership—we will experience a calling that is fulfilling beyond measure, and one in which the results are undeniable. Austin Krohn was raised in Fresno, California, attended the U.S. Air Force Academy out of high school, and graduated in 2010. He is currently working on a masters degree in public policy at the University of Maryland, and leading an OCF Bible study with the ROTC units on campus.